"A Chronicle of England - Page 226 - John Signs the Great Charter"
Today marks the 800th anniversary of the Magna Carta and as Christians, we would be remiss to not take a few minutes and reflect upon the significance of the document and what it has meant to America, the Founding Fathers and our foundation of liberty. So, please join me as I explore more of it's history. 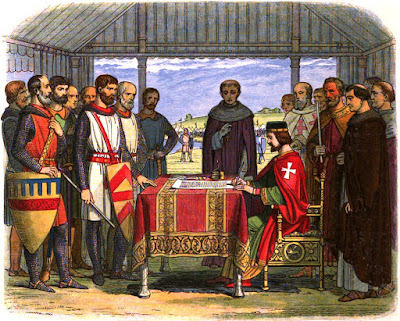 Magna Carta exercised a strong influence both on the United States Constitution and on the constitutions of the various states. However, its influence was shaped by what eighteenth-century Americans believed Magna Carta to signify. 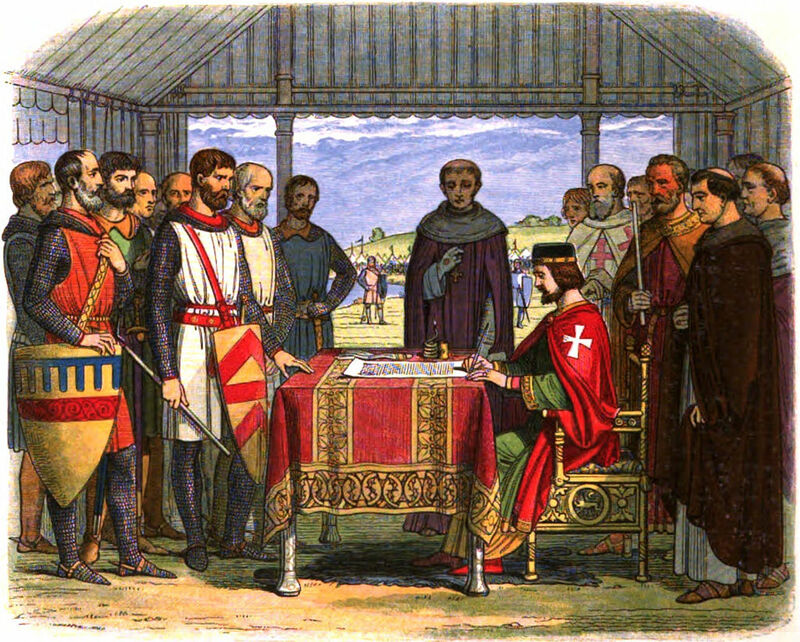 Magna Carta was widely held to be the people’s reassertion of rights against an oppressive ruler, a legacy that captured American distrust of concentrated political power. In part because of this tradition, most of the state constitutions included declarations of rights intended to guarantee individual citizens a list of protections and immunities from the state government. The United States also adopted the Bill of Rights, in part, due to this political conviction. Both the state declarations of rights and the United States Bill of Rights incorporated several guarantees that were understood at the time of their ratification to descend from rights protected by Magna Carta. Among these are freedom from unlawful searches and seizures, a right to a speedy trial, a right to a jury trial in both a criminal and a civil case, and protection from loss of life, liberty, or property without due process of law. Many broader American constitutional principles have their roots in an eighteenth-century understanding of Magna Carta, such as the theory of representative government, the idea of a supreme law, and judicial review. 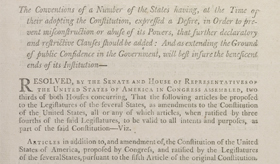 Proposed Articles of Amendment to the Federal Constitution [Bill of Rights]. [James Madison’s personal copy of printed broadside]. New York: Thomas Greenleaf, September 14, 1789. The amendments to the Constitution that Congress proposed in 1791 were strongly influenced by state declarations of rights, particularly the Virginia Declaration of Rights of 1776, which incorporated a number of the protections of the 1689 English Bill of Rights and Magna Carta. 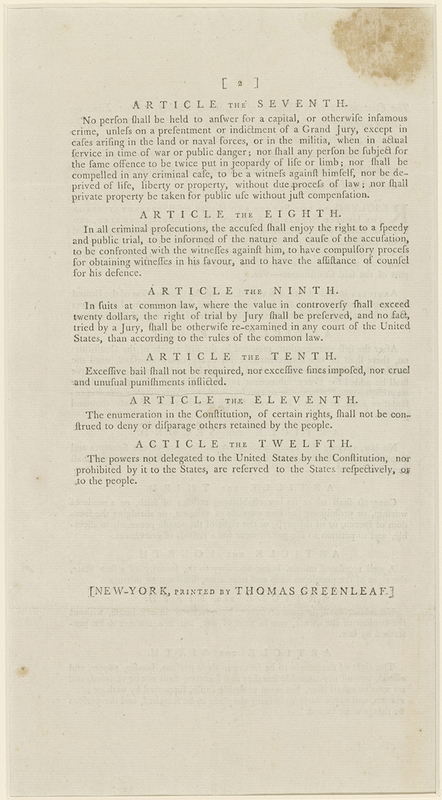 The fifth through tenth articles of the proposed amendments, which correspond to the fourth through eighth amendments to the U.S. Constitution as ratified, embody this tradition most directly, guaranteeing speedy justice, a jury trial, proportionate punishment, and due process of law. Another resource I recommend to learn more about the impact of the Magna Carta from a Christian perspective is Dr. Peter Hammond's audio message "Blessing the Nations: Magna Carta 800" posted at Sermon Audio.com (77 minutes). You can read the full text of the Magna Carta here. May the good Lord keep the flame of liberty alive in His peoples hearts for the good of the nations and future generations of Christians. May we never forget our Christian heritage and it's legacy of freedom to worship our Lord and Savior as He commands, while living our lives in peacefulness and freedom from tyranny imposed by wicked men. Thank you, Angela. This is excellent and a great reminder of why our forbears fought for and won freedom on our behalf, but primarily what the Lord Jesus did to set us all free. Be blessed.